NOTD - China Glaze "Emerald Sparkle"
Rimmel I Love Lasting Finish "Azure"
OPI "Purple with a purpose"
I have been suffering from ingrown hairs since I started epilating. Some people say epilators make them worse, but I swapped to waxing and they are still really bad. My theory is that any means that pull hair out I think will cause them. Anyway, I decided to try Tend Skin Liquid which claims to make ingrown hairs and nasty shaving bumps disappear. It isn't cheap, it retails for about £12 a bottle of 118ml, so it better be good, I thought. 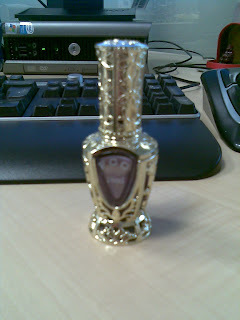 When I first opened the bottle, OMG, the smell.. :( It is hideous. No, really, it is. It has a pungent vinegar-y medical smell, almost like a worse version of Salubrin (it's Swedish cure-all liquid that you were tortured with as a kid for everything from midge bites to sunburn). 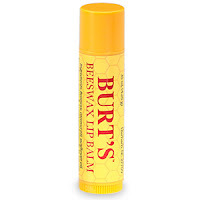 It stings a tiny bit in any open, sore ingrown hair bits (if you have them you will know that its almost impossible not to pick at them). The smell faded away a bit once the liquid has dried on. 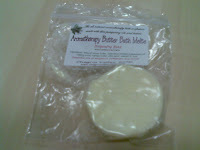 But sitting at my desk in the office, I could still smell it vaguely on my skin 5 hours later. After 2 applications, the red bumps have faded down from in your face angry to more pink, so here is hoping that a week of this will remove them :) I will keep you updated on how this have worked in a weeks time! NOTD - SH "Amber Ruby" over Rimmel "Sunset Bronze"
This is not my finger - I got my male best friend to model it for me as I am already rocking a glitzy silvery manicure of Rimmel "Your Majesty". That's why it looks a bit dented too - men aren't very good at drying their polish! This was two layers of Rimmel Sunset Bronze, which is a shimmery bronze auburn rust colour, and one layer of Amber Ruby. It has a really deep glow of maple leaves in the autumn in the crisp, cold sunshine :) Fantastic! High impact silver shimmer, opaque in 2 coats. Almost chromed, it is that shimmery! It's similar to pictures of Zoya Trixie, but I will have to get a bottle of that first to compare :) All of Rimmel's Londons UK range are lovely inexpensive colours and usually dry mega fast (1 coat of Seche Clear, 2 coats of the polish and a coat of Seche Vite is dry in 15 minutes!). I have always shunned the built-in-brush foundations. I was convinced it wouldn't work. Too much product and then trying to work it all in.. Being used to separate brush and blob of foundation on the back of your hand, I was not convinced this modern invention would work very well. I have fallen in love with Bourjois Brush Foundation. I tried it in the shop and decided I would buy it. It was pricey (£12) but I thought oh well, could be good, the shade suited my paler autumn face just brilliantly.  You will need about 4 clicks of the pump mechanism for your whole face depending on your preferred coverage. The brush is stiff enough to give a good work in and tapered to a edge to lend precision around the nose etc. There are colours to suit most British complexions, but I am the 3rd darkest shade, and I am not particulary tanned at the moment, which means this range does not cater for dark skin tones. But it is amazingly easy to use. I have shelved my old stuff already and getting stuck in with this :) I will post some pictures later on today. From left: 541 Gasoline (micro-glitter purple); 548 Green Hawaii (multicoloured micro-glitter grass green); 547 Blue Monday (micro-glitter navy). Who can you call on when your feet are cold because you are too cheap to turn on the heating in your house? Who makes a really long shopping trip seem effortless and enjoyable no matter the weather? Who looks really ugly and makes your S-O sigh and wish you didn't love them so much and wore them all the time? Who, but the mighty "Ugg" boot. I discovered these gems last year, when I at bonus pay time at my new job decided to splash out on a genuine pair of Rum Raisin Ugg Short boots. I wore them all-the-time. They have now worn so badly on the sole I have had to investigate the prospect of getting a new pair of boots. This time I decided that perhaps another company made same sort of boot with a better, sturdier sole? That is how I found Emu Australia. I bought the Stinger Hi in black, and dearie me, it is the boot of my dreams!! 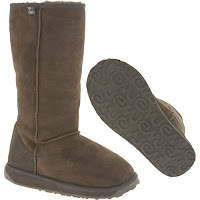 Compared to the Ugg boots, these come with a nice rubber outsole, which is what cinched it for me. The Ugg soles are too flimsy (they were originally meant to be worn indoors). The shaft of the boot is also slightly leg shaped which fits nicely over my rather curvaceous calves. I would order your normal size in these boots; I am a 5, but I had UK size 4 Ugg boots as UK5s were too big, but these are a UK size 5 and I couldn't have fitted into a UK4. Bear in mind also that only the Stinger range of Emu Australia is the same sort of inside-out sheepskin as the Ugg boot and they retail for a bit less than the Ugg boots. The Bronte is only sheepskin lined and costs a fraction of the price of the sheepskin boots. I sprayed my boots with suede water-repellent spray to keep them nice and waterproof-ish. Doing this will slightly darken your boots but since mine were black this doesn't matter. It makes them last a lot longer though! 1) Always waterproof your boots BEFORE you wear them! 4) Wear with EVERYTHING but make sure you don't wear them on a night out, red wine stains is NOT a good look..
NOTD - Sally Hansen Nail Prisms "Amber Ruby"
I saw this on Rocketqueens blog, and I had to have it. It is a red-gold duochrome. It is as gorgeous on the nail as it is in the bottle. Rocketqueen managed better pics of it, hers were over OPI Midnight in Moscow, but this photo gives an indication of the autumn gold that is this colour just as it goes on the nail in two coats. I got so many positive comments for this polish - even from men! It seems everyone loves it, and rightly so. It is like a metallic autumnal maple leaf - firey and golden at the same time :) However, it doesn't apply very evenly and the wear is less than 3 days even with Seche Vite (the pic is after one day) , but it is a fantastic colour and well worth the hassle. 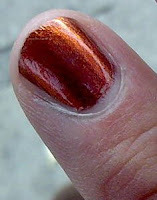 The pic shows 1 coat Seche Clear, 2 coats Amber Ruby and 1 coat Seche Vite. I will try it again next week over a Rimmel colour called Sunset Bronze which is a golden-sparkly dark chocolate polish. 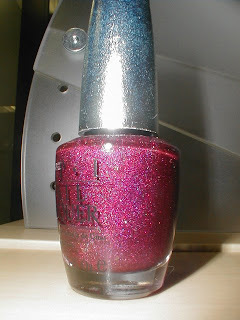 New OPI Designer Series #26 "Extravagance"
My new OPI DS arrived this morning, and it is lovely! Just the sort of colour I longed for for autumn :) Rich jewelled magenta with holo sparkle. It is like a precious gem! I used the flash to try and capture the sparkle but it doesn't seem to have captured it properly; the magenta colour is true to in real life colour however. My work buddy came back from holiday this week and she brought me a treasure trove of nail polishes back from Tenerife - I just wanted to quickly show the best ever nail polish bottle design! :) The brand is marked as FCC, never heard of it, but just look at that bottle!! New OPI Designer Series Colours! Check out the new DS colours here!